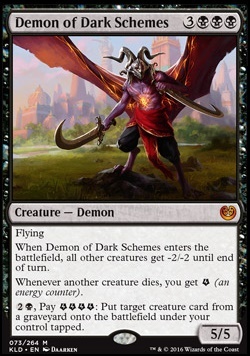 When Demon of Dark Schemes enters the battlefield, all other creatures get -2/-2 until the end of turn. 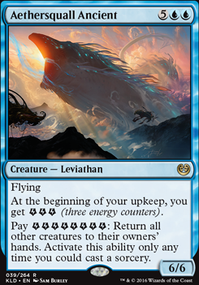 Whenever another creature dies, get E (an energy counter). 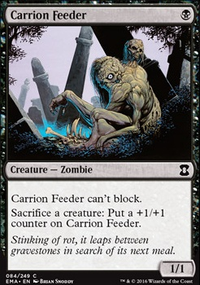 , Pay EEEE: Put target creature card from a graveyard onto the battlefiend under your control tapped. 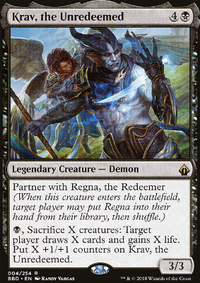 Maybe cut Apex of Power , some of the boardwipes (just looks like you have a lot in there), Devour in Shadow Red Elemental Blast , Smother , Demon of Dark Schemes , Sinister Concoction , Sunbird's Invocation , Smoke , Uphill Battle and Hoarding Dragon . You also don't have Path to Exile , was that on purpose? 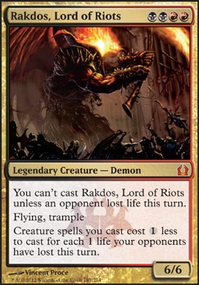 Vindicate might be good as well. 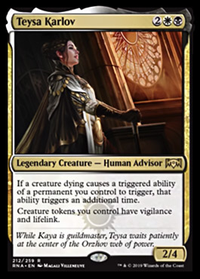 Liliana of the Veil ? Liliana, Heretical Healer Flip might actually be dope. That emblem would be nuts. 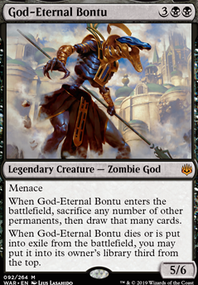 Sorin, Solemn Visitor isn't terrible. I'm here as requested. I'll take a more in depth look later when I have time. For now just take my +1 and initial thoughts. Demon of Dark Schemes and Ashes of the Abhorrent can do work with Teysa. Fumigate is also an amazing card. Martyr's Bond is also another Dictate effect. Couldn't run demon in our variant because its more of a token/come back from wipe focused variant..but might serve you extremely well. All these cards will also work with Sun Titan . This deck is straight combo. I don't know why you're trying to turtle. Also, Massacre Wurm / Demon of Dark Schemes + Linvala, Keeper of Silence + Living Plane is much cheaper than Elesh Norn, Grand Cenobite IMO. Infinite mana does look nice with Grenzo's ability. You'll get to play all the creatures in your deck. Combine it with Demon of Dark Schemes or Noxious Gearhulk for some fun. It would be nice to have a haste effect or life drain effect as well to kill them off, like Blood Artist or Anger .